Well now, I can’t believe it is June already and I am writing my first race report of the year. Not so much a race report as an account of what has been happening this year. Of course during the winter it may have appeared that we were doing nothing, but that could not be further from the truth. In reality we have spent much time investigating possibilities for a change in 2008. These centred around a choice of moving to Top Fuel or staying in the same class but with an A-Fuel combination. This kind of decision involves both the technical and financial aspects of each route, technically we felt that either choice was going to be a steep learning curve but with the friends and contacts we have we could succeed in either class. Included in the decision were our primary sponsors and marketing partners Silverline Tools and PlayStation, both of whom pledged their support for the coming year at an early stage and were happy to allow us to make whatever choice we felt was best. So it was in February we made the choice to move over to the A-Fuel combination. That now seems such a long time ago as the work rate immediately increased and as yet has not slowed down or stopped. David and I first made a trip to the US for a long weekend to visit Bill Reichert at his shop. Having known Bill for many years we had absolute trust in his abilities (as demonstrated by his back to back world championships) and more importantly his ability to convey to us all the things we now needed to become familiar with. It quickly became apparent that we needed to forget everything we had learned in the last thirty years and start again with a clean sheet, something that we are still proving to ourselves every day five months later. Having gleaned as much information as possible from that trip as regards to parts required and setup we launched into ordering all the very different parts we needed, at the same time work had to start on the chassis which was now not suitable as the A-fuel car needs a different engine location (no gearbox) and different wings front and back, even different wheels and tyres not to mention the “little” things like fuel tank, fuel pipes, dashboard, data logger, clutch linkage, etc., etc., etc., all different and would have to be constructed by us in the time available (not much). 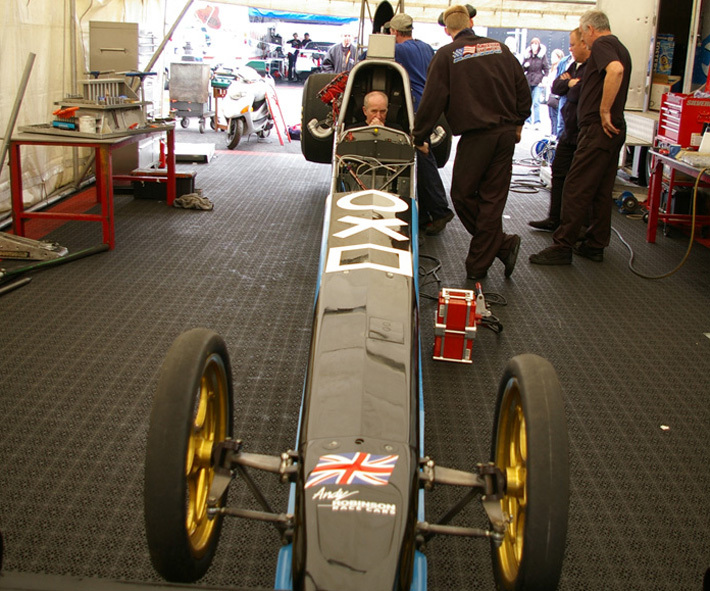 We had already hatched a plan to convert our trusty Hadman chassis into a two piece car with alternative bolt on rear ends for both the original blown alcohol set up and our new A-Fuel setup. 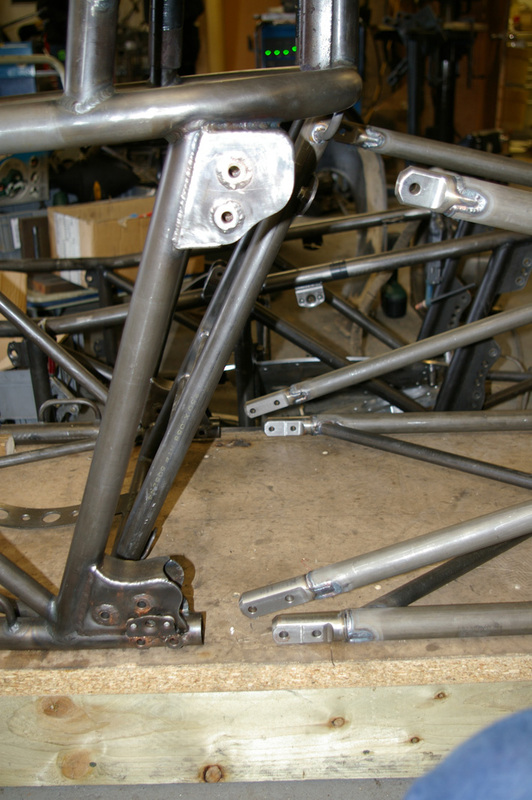 We set about doing the first stage of this making the original one piece chassis into a two piece bolt on with the original rear half so that we could run at the Easter event as the original blown car but with the new two piece chassis to test. In the event all that work was for nothing as the whole event was washed out and eventually snowed off! 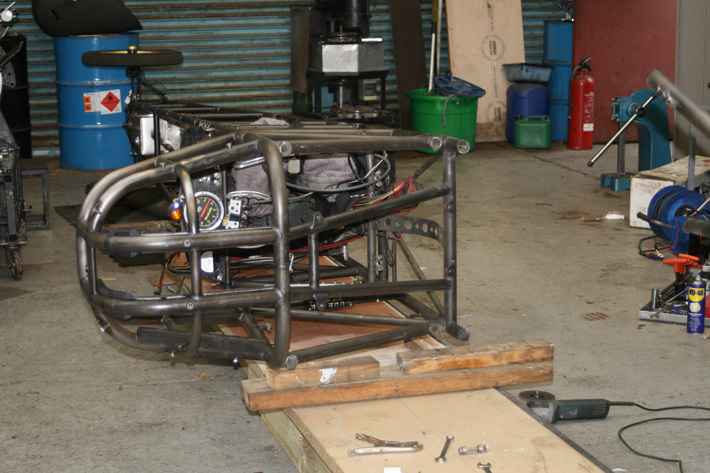 That left us with barely eight weeks to build a new rear chassis and convert the whole car to A-Fuel. At this point I have to acknowledge the exceptional help of a number of people. 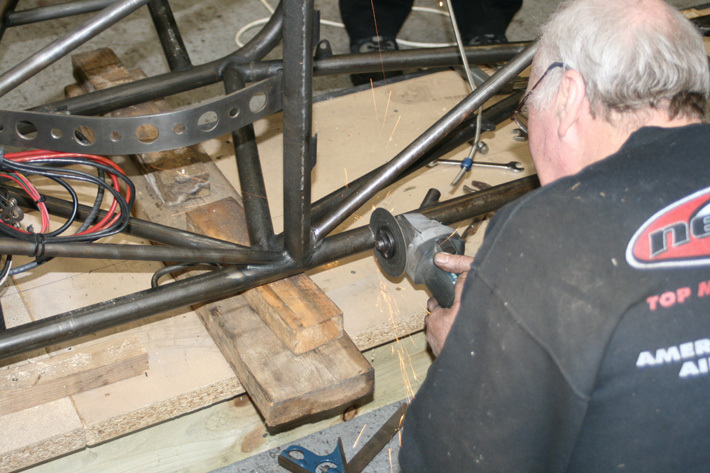 First up, Andy Robinson who allowed us the use of his workshop and equipment to build the new rear end and even did most of the welding himself. Of course it did not stop there as with his stocks of everything from chassis brackets to cables and materials plus his help and assistance saved us loads of time on the project. Next Gary Burgin, he really excelled himself by sourcing the parts and on many occasions the information or modifications needed to make those parts work, without any doubt whatsoever this project would not have been possible in the time available without his valuable input. 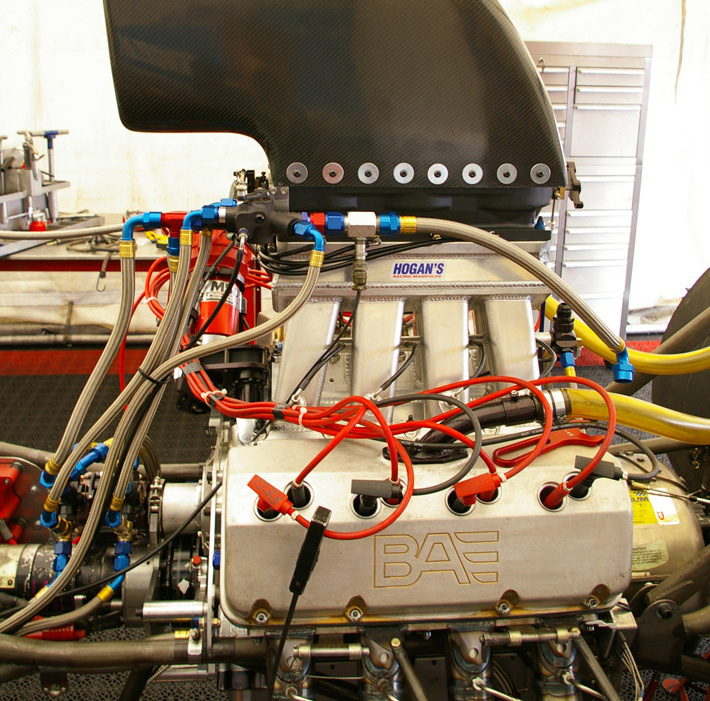 Barry Miller of Brown & Miller Racing Solutions made up a set of hoses almost on demand at the end of the project, as the fuel system now exceeded 500 lbs pressure we wanted the best there is just like the guys in US Top Fuel and Nascar, who they also supply. All this activity had to be interrupted with another trip to the US for a long weekend in order to be with Bill when he ran at the Atlanta NHRA event. It was hard enough to gain all the information needed to source parts and build a car on our first trip, but now here we were in Atlanta trying to get an idea of how on earth you operate and tune one of these cars. Once again the total difference in approach with regards to tuning the car became immediately apparent. There is a lot of new tricks to learn, his first run 5.62, his second run 5.29 and No.1 qualifier just illustrated the potential of these cars if you can figure them out! Back to Blighty and full steam ahead to get the car finished and running before the Main Event. It quickly became obvious we were not going to make any test days before the event, some of the crucial parts had yet to arrive and without some of them we could not progress with the detailed construction of the car. However some last minute miracles from Gary Burgin and a sterling effort by the crew saw us putting the finishing touches to the car on Friday 23rd, the day when we should have been setting up at the track! We worked on through Friday night, overcame such “minor” obstacles as the starter trying to detach itself from the engine and needing some modifications to fix it, crank triggers that refused to bolt to the engine in the desired place and needing new brackets, wheel nuts that decided to cross thread themselves in the middle of the night, etc., etc., and then at midnight the big one NO OIL PRESSURE. On investigation we find a hole in the main oil gallery inside the block of the now completely built engine. So out comes the engine, a complete disassemble to the bare block and a modification designed and made to fix the problem, a rebuild of the engine and fitting in the chassis, and by 4 o’clock that problem is fixed. Now it’s Saturday and qualifying starts at the track in seven hours and the track is three hours drive. So we decide the abandon plans to start the car before we leave and just load the car and leave for the track which we do at 6 o’clock. We duly arrive at nine and proceed to get pitted and carry on preparing the car. 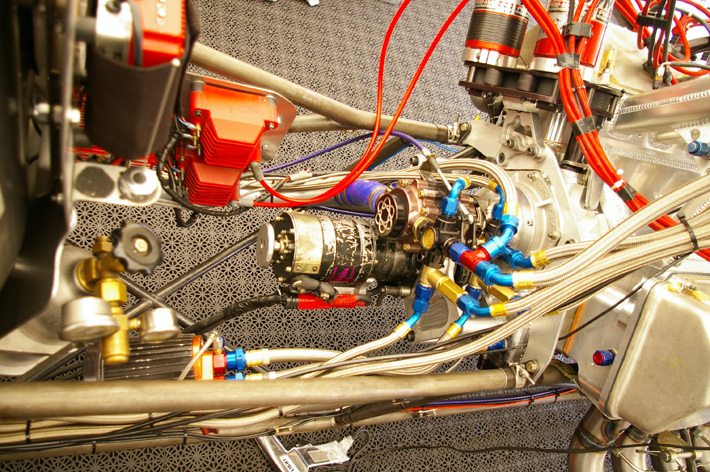 Before we can consider going to the start line to qualify we first have to run the engine on methanol to warm it up, check out all the systems and set the idle speed, then run it on nitro in the pit to establish the correct settings for the fuel system and clutch. The problem we encounter is too high an engine idle speed and our data logger not giving us correct information. By the end of the day we have the engine idling correctly but still have problems with the data logger and by now have missed both the qualifying sessions. This is a serious situation as rain is forecast for tomorrow and if that happens we will not be able to attempt a qualifying run and will be out of the competition before it starts. With no points and with the winner of the event on 90+ points we would be out of championship contention for the year! Sunday dawns and sure enough its raining. Nothing we can do about that but we can still work towards solving our problems with the car, we close out the day with another little problem related to the rocker arm oil supply which needs some repairs and modifications ready for the next day when although we are out of the competition, not having qualified, due to time and rain we will be able to sort out the car some more by running it in the pit. Monday, bad for drag racing and the rest of the racers but good for us (they say its an ill wind that blows no good) its raining come time for the eliminations and it continues to rain until the race is called off. What this means for us is that instead of being 90+ points behind we are actually 43 points behind the No.1 qualifier Paul Enger from the Islanders in our old car. Congratulations to them on their first No.1, but for us 43 points is not an insurmountable lead, we are behind but still definitely in the Championship chase. Also we finally got to run the car on nitro and although we still don’t have all the data we need everybody seems to think it looks and sounds fine. So onto the next race for the Championship at Alastaro Finland, but before that we plan to attend the Summer Nationals at Santa Pod on the 14th/15th June for serious testing when there will definitely be “Fire in the Pipes” and no late arrival.